Add curb appeal and a distinguished look to your home using the Whitehall White Ultimate Personalized Mailbox Package. This kit creates a truly remarkable and elegant mail receptacle, complete with your own information. The deluxe mailbox is crafted from aluminum, with a white, powder coated finish for color and style. It's approximately 20% larger than standard mailboxes, easily accommodating magazines, catalogs, and even small packages. This box attaches to the included post, and is then supported by brackets for added design. The included newspaper box rests beneath the mailbox, adding more function and style to this unit. The mailbox features a magnetic closure, keeping your mail protected from the elements. Personalize this mailbox with the two included side panels, door panel, and two-sided topper. Each side panel can accommodate a single line with up to five 4.5" numerals, displaying your house number easily. For more versatility, opt for two lines on the personalized panels. With this option, the top line can hold up to five 3" characters, while the second line has room for up to sixteen 1.25" characters. The door panel can accommodate up to five 1.75" tall characters, and the two-sided topper holds up to sixteen 1.25" characters for your name. The gold hue on the personalized information perfectly enhances the white body, for a classic color scheme. Insert a wooden 4 x 4 post (not included) into the metal post for strength and stability, and install the wooden post into the soil for a lovely station. 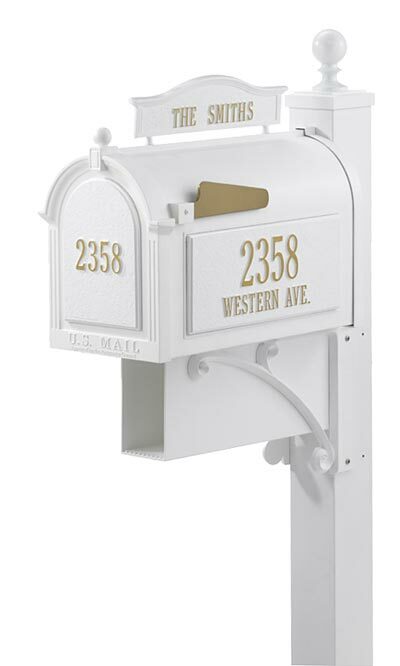 Distinguish your home from others on your street with this White Ultimate Personalized Mailbox Package. Assembly required.